Pd nanoparticles were prepared with reverse micelles of water/AOT/isooctane solution and deposited onto silicon or InP substrates by electrophoresis. A large change of capacitance-voltage characteristics of mercury contacts on a semiconductor was found after Pd deposition. This change could be modified when the Pd deposition is followed by a partial removal of the deposited AOT. 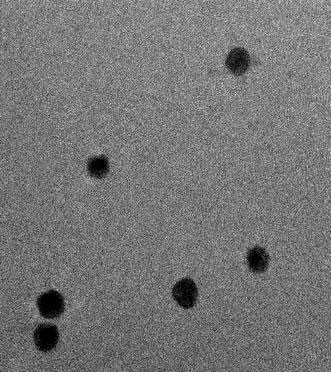 The deposited Pd nanoparticles were investigated by optical mictroscopy, SIMS and SEM. Finally, Schottky diodes with barrier height as high as 1.07 eV were prepared by deposition of Pd nanoparticles on n-type InP and by a partial removal of superfluous AOT. These diodes are prospective structures for further testing as hydrogen sensors. Formation of stable, reproducible high-barrier metal/InP interfaces is an essential prerequisite for the development of high-speed electronic devices, charge-control devices, optoelectronic detectors and wave-guides. High quality metal/InP interfaces are demanded also for good performance of InP based particle detectors. Recently, sensors of hydrogen  or NO2 gas  based on metal/InP interfaces have been reported. Gas sensors have been used for industrial process controls, for detection of toxic environmental pollutants, in the area of human health, and for the prevention of hazardous gas leaks, which comes from the manufacturing processes. Harmful effects on human health of such gases as NO2 in the environment and the need for gas measurements in manufacturing processes has led to an increase in research of gas sensors. There are many types of gas sensors that have been used for the detection of various gases. However, these are gas sensors based on metal-semiconductor interfaces that are playing an important role in the detection of toxic pollutants and the control of industrial processes. Recently, high-sensitive sensors of hydrogen-gas based on Pd-InP Schottky barriers have been reported . The authors claimed that the barriers were prepared by a simple electrophoretic deposition of reverse micelles water/Pd-nanoparticles-AOT/isooctane. In this paper we report, inspired by Ref. 3, the preparation of metal-InP interface by deposition of Pd nanoparticles. First, we obtained deposited layers of Pd nanoparticles which were electrically isolated from each other and from the semiconductor substrate. Obviously, remnants of AOT were deposited with the Pd nanoparticles and this was the cause of the electrical isolation. Thus first we have studied the layers deposited onto Si substrates which are less expensive than InP and tried to remove superfluous AOT. Finally, Schottky barriers on InP have been prepared by removing superfluous AOT from the deposited layer and by optimizing electrophoresis parameters. The Pd nanoparticles were prepared in isooctane colloid solution by reverse micelle technique following Ref. 3. 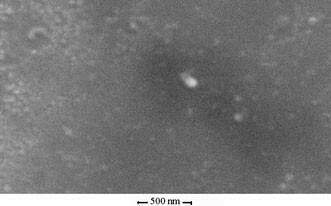 Two solutions were prepared with low-disperse spherical Pd nanoparticles of 10 nm and 7 nm diameters, determined from transmission electron microscope (TEM) images seen in Fig. 1 and Fig. 2. In Fig. 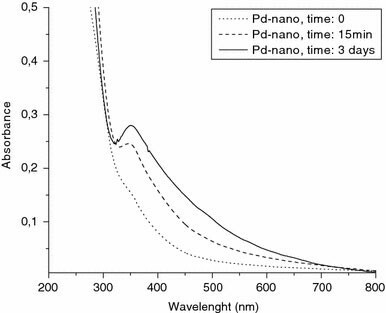 1 there are Pd nanoparticles of 7 nm diameter with 10% dispersion and in Fig. 2 there are those of 10 nm diameter with 10% dispersion. Optical absoption spectra of Pd nanoparticles in colloidal solutions were measured on a split-beam photo-spectrometer at room temperature. A typical spectrum can be seen in Fig. 3. The sharp peak at 350 nm wavelength can be assigned to surface plasmon frequency of spherical 10 nm Pd particles in isooctane. It can be seen in Fig. 3 that the peak develops successively as the metal Pd nanoparticles are formed in reverse micelles. Polished Si wafers with the doping concentration 4 × 1014 cm−3were used as substrates for electrophoretic deposition of Pd nanoparticles from colloid solutions at room temperature. The shape of the electrophoretic cell was designed to create a proper electric-field-gradient for deposition of electrically neutral metal particles of Pd. Layers of various thicknesses were prepared by varying the time of the deposition. When longer times were applied larger particles with the diameter about 100 nm were formed in the deposited layer, as observed by optical microscopy, besides the unresolved background presumably of 10 nm diameter Pd particles. Optical microscope image with Normarski contrast of Pd nanoparticles deposited onto polished Si substrate can be seen in Fig. 4. 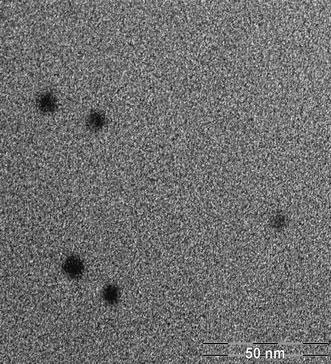 Several ball shaped objects of much larger size than 10 nm are present besides the brownish background of varying intensity. The brownish background is emphasized by scratches on the polished substrate. 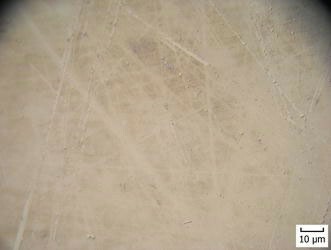 The scratches were unobservable on the substrate before the deposition. Obviously, they modify the gradient of the electric field and thus the thickness of the layer of the deposited Pd particles. We presume that the brownish background is formed by unresolved 10 nm Pd particles. The presence of Pd in the deposited layer was proved by secondary ion mass spectrometry. 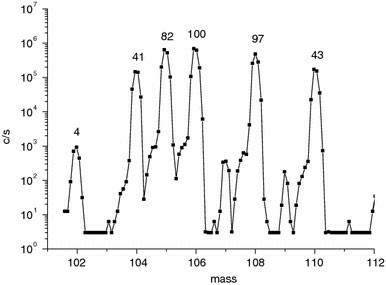 Mass spectrum showing the main peaks of Pd isotopes is shown in Fig. 5..
Definiteness of the assignment is given by approximately correct ratios of Pd isotopes 105, 106, 108 and 110. Pd isotope 104 interferes with an unidentified cluster ion. The peak amplitude of the low ratio Pd isotope 102 (not shown in Fig. 5) is on the noise limit. 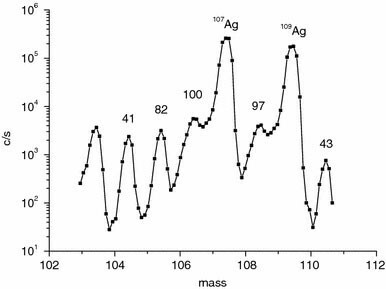 The peaks 107 and 109 correspond to silver isotopes. Numbers above the peaks of Pd isotopes correspond to the natural isotopic ratios with number 100 assigned to the isotope with the largest natural content. 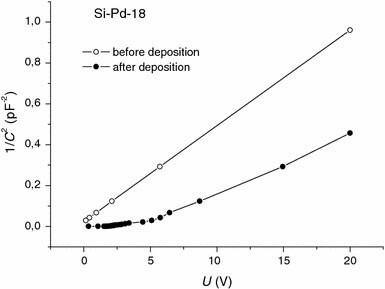 For comparison a spectrum of Pd isotopes of 30 nm thick Pd layer deposited by vacuum evaporation on Si substrate is shown in Fig. 6. Shoulders on the left side of peaks at mass 104–106, 108 and 110 in Fig. 6 are due to asymmetric peak shapes. Attempts to characterize the layers by scanning electron microscopy have been made. A SEM image made with the highest magnification is shown in Fig. 7. Several objects of much larger sizes than 10 nm can be seen. They represent unwanted debris probably mixed to the solution before processing the electrophoresis. Elemental analysis of these objects has shown no presence of Pd. On the other hand their main composition was of silver. Silver was probably mixed to the solution from the conductive silver colloidal paint used for fixing the sample to an electrode before starting electrophoresis. This observation correlates with SIMS data shown in Fig. 5. Besides the larger objects there are also seen several small ball shaped objects in Fig. 7 (alerted by arrows). They might be the Pd 10 nm particles. However, no elemental analysis of these objects could be made because of equipment insufficient sensitivity. Interesting new results have been obtained by measurements of capacitance-voltage (C-V) characteristics with a mercury probe. The mercury probe consisted of two electrodes with areas ratio 1:100. The diameter of the smaller circular electrode was equal to 0.3 mm. While the dependence of C −2 vs. V measured on the Si substrate without Pd layer was linear the dependence measured on the Si substrate with the deposited Pd layer was strongly nonlinear as can be seen in Fig. 8. The nonlinearity was particularly pronounced at small values of the voltage bias. While the capacitance measured on a non-deposited Si substrate at zero bias was about 10 pF its value on the deposited one was an order of magnitude larger. Simultaneously, the loss part of the impedance increased substantially at zero bias and went to low values with increasing bias. First we proposed that the electrically isolated metal nanoparticles placed between the Si surface and the mercury electrode could deform the C −2 vs. V dependence due to induction of surface plasmons in metal nanoparticles by the high-frequency 1 MHz test voltage of the capacitance meter. However, the frequency 1 MHz is rather low to induce surface plasmons. An induction of vibration modes of Pd nanoparticles bound to AOT matrix on the Si surface seems more probable. When Pd deposition was followed by the removal of superfluous AOT from the deposited layer the observed nonlinearity of C −2 vs. V characteristic was modified. In order to make a Schottky barrier on InP with Pd nanoparticles using the deposited layers we tried to remove the remnants of AOT from it. Partial removal of AOT has been achieved by using hydrogen peroxide as indicated in Ref. 4 and/or by ionic etching . Newly, we have achieved partial removal of AOT by treating samples with deposited Pd layers in isopropyl alcohol. After a series of experiments performed on Si substrates with such treatment and by optimizing parameters of the electrophoresis, deposition of conductive layers of Pd nanoparticles has been achieved. Then we followed with the depositions on polished InP substrates. A SEM image of such a layer on InP can be seen in Fig. 9. The white spot is an incidental object present on the surface used for focusing the instrument. The granular background is formed by Pd nanoparticles. The image shows nanoparticles of various sizes. 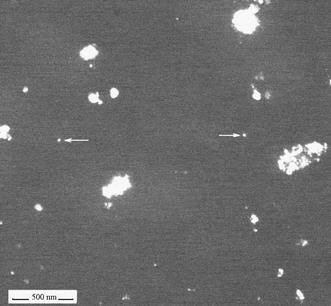 The images of the smallest 10 nm particles are rather unclear as their size is on the limit of the instrument resolving power. 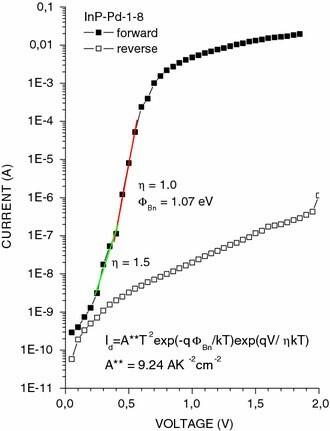 where η is the ideality factor, Φ Bn the Schottky barrier height, A ** the Richardson constant (9.24 A K−2 cm−2 for InP), k the Boltzmann constant, q the elemental charge and T the absolute temperature. Semi-log plot of Eq. (1) gives a straight line from which the ideality factor η and the barrier height Φ Bn can be determined. The graph in Fig. 10 shows that the barrier height of the prepared diode is 1.07 eV and the ideality factor at bias voltages above 0.4 V is equal to 1. It is well known that metal-InP interfaces are usually subjected to a strong “Fermi level pinning” with the consequence of small barrier height on the metal interface with n-type InP . The barrier height value 1.07 eV of the prepared diode is the highest value ever reported as far as we know. It is even far higher then 829 meV achieved by the same method previously . The high value of the barrier height indicates a very low Fermi level pinning which is much promising for a good performance of the diode as a sensitive hydrogen sensor. Besides, a high quality of the diode is demonstrated by its ideality factor equal to 1. The authors thank Dr. Svetla Vackova and MSc. Zdenek Jarchovsky for providing SEM images, MSc. Vaclav Malina for measurements of layer thicknesses and MSc. Ladislav Pekarek for providing InP crystals. The work has been financially supported by Academy of Sciences of the Czech Republic, grant KAN400670651 in the program Nanotechnology for Society.